In the seminal 1989 film Back to the Future II, Marty McFly and Doc Brown take a trip from the 1980s to the future date of Oct. 21, 2015. They travel in a junky DeLorean that Doc Brown, played by Christopher Lloyd, rigs to be powered by fuel cell technology. Now, Toyota has a variation of the hydrogen fuel cell technology the film predicted. It powers the new Mirai model, and the automaker reunited Michael J. Fox and Christopher Lloyd to promote it. 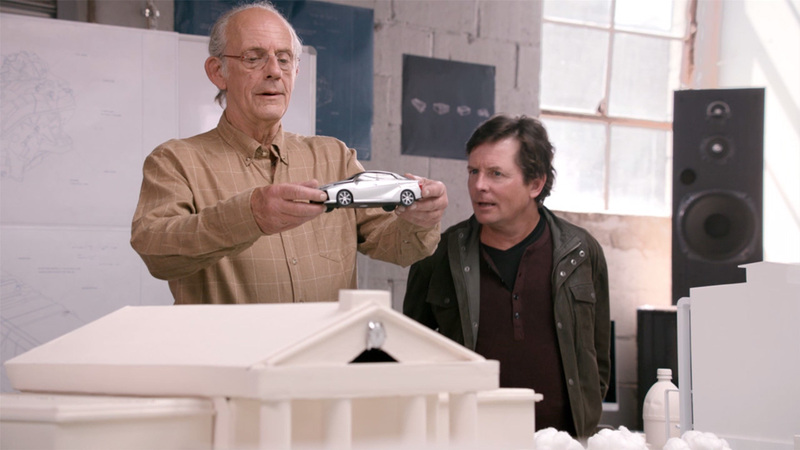 Part of the "Fueled by Everything" campaign from Droga5, the Back to the Future II work kicks off with two teaser spots (see below), and the full five-minute video will launch on Oct. 21. With this campaign, Toyota effectively joins Pepsi and Nike in their attempts to make the future of Back to the Future II a reality (see Pepsi Perfect and, hopefully, Nike's self-lacing shoes). "Over the years we've had a lot of fun predicting which Back to the Future fictional 2015 technology would arrive by the real year," Fox said in a statement. But it's a bit different for Toyota as the brand has been working on hydrogen fuel cell technology for two decades, according to Doug Coleman, national marketing and communications manager for Toyota's advanced technology vehicles. "It was this really wonderful coincidence that we're bringing to market the first time, in a retail way, a new fuel cell vehicle that runs on hydrogen, and that launch date happened to be October 2015," said Coleman. "From a development point of view, there was nothing magical about that date other than that it coincided with the deployment of hydrogen fueling stations in the state of California." And 10 months ago, when conceiving possible marketing for the new Mirai, Droga5 "recognized the amazing opportunity," said Coleman. "We realized this happy coincidence that October 2015 just happened to be this magical month in which Marty McFly and Doc Brown go back into the future." "And then even more magical, Mr. Fusion [the fueling component of the DeLorean] from the film, uses hydrogen—but in a very different way," said Coleman. "It can be fueled by trash to create energy. Our car does effectively the same thing. We can use trash, transition that through several processes into hydrogen and ultimately fuel the Mirai." The Mirai has already launched in Japan. Initially in the U.S., Toyota will only roll out roughly 1,000 Mirai vehicles in California. Toyota will introduce the Mirai to the Northeast and other regions as hydrogen fueling stations are created.